Yamaha XT660Z Tenere lowering links for year models from 2007 onwards. This 1 inch lowering kit for Yamaha Tenere XTZ660 reduces the seat height and lowers the center of gravity. Excellent modification for shorter Tenere riders. 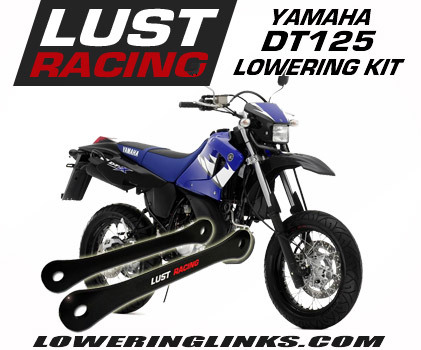 High quality aftermarket accessory lowering kit made by European motorcycle lowering kit industry leader Lust Racing. Yamaha XT660Z Tenere 2007 – 2013 lowering links. Reduces the seat height and lowers the center of gravity. Very good modification for shorter riders who may find the Tenere to tall. If you ride your Yamaha Tenere in the city and have to stop frequently at red lights in intersections and get tired of tip-toeing this high quality lowering kit is the answer. This kit is made by Lust Racing the leading European motorcycle lowering kit manufacturer. Top quality steel suspension links that will never fail. This kit lowers the bike by 1 inch (25mm). The reduced seat height and the lowered center of gravity makes the bike considerably easier to handle.